Beauty, no matter the season [part II]. 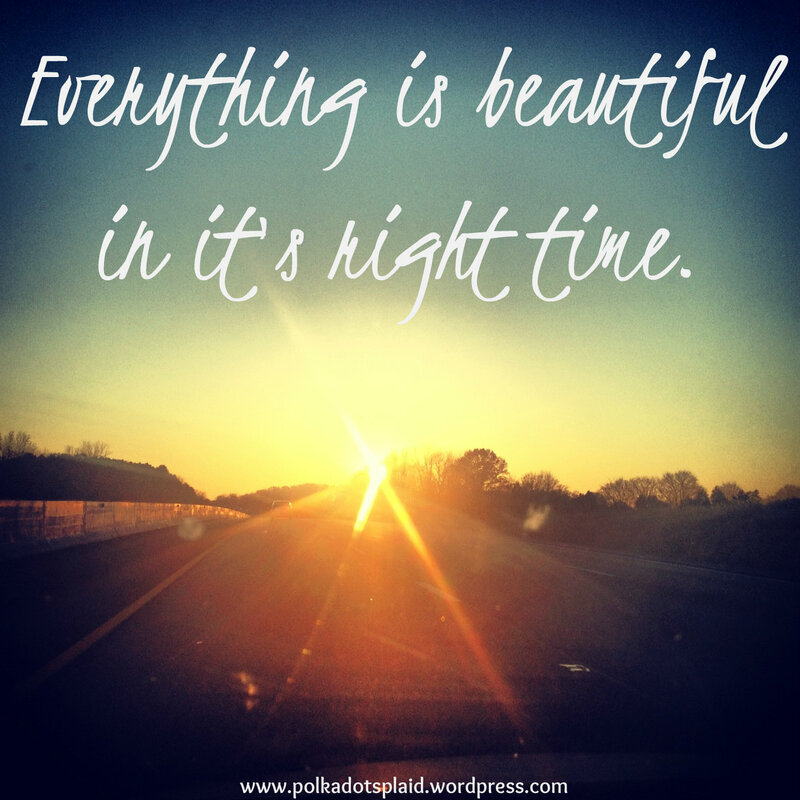 Everything is beautiful at it’s right time. Furtick touches on this idea – that everything is beautiful in it’s own time. What was meant for a blessing can be a burden if it occurs at the wrong time. Think of a marriage that wasn’t meant to be – it is not beautiful, it is rough and trying, and difficult to work through at times (or often). But a marriage that is experienced at the opportune time that God planned, once the planting season has finished and it is time for reaping, is beautiful even in it’s rough, trying and difficult times. God intends to bless you, He will bless you, but don’t hurry the process. Let him teach you what he needs to while you wait. Use this time to be thankful for what you have and what you are able to do, because one day you may not be able to. Use this time to grow and to foster growth in others. Don’t waste any moment. Hear that brothers and sisters – God put the longing for eternity into our hearts and it will never be satisfied by anything in this life, on this earth. As a Christian, I am always longing for eternity, especially in these winter seasons, and God created me that way. But, friends, He doesn’t want us to waste away our mission here on earth because we are longing for eternity. I also don’t believe He wants us to waste away any season because of a longing for the next. In essence, that’s why I started this blog. I am in a winter season and I am trying not to let it go to waste. I want to share the lessons I am learning, in hopes they will bless and minister to someone else in a winter season. I’m also hoping they will be reminders of my winter season when I am in a spring season. What season are you in? What joy or positivity can you speak into it today? In my last post, I briefly touched on time and seasons, especially those of waiting. I also told you how I had been listening to the Elevation Church Podcasts about Times and Seasons. Today, I sat down to think about all that I’ve been hearing, and reflect on the beauty of each season. In the first sermon of the series above, Pastor Steven talks about speaking positively about the season you are in. This hit me hard. You know they say “you are what you eat” but it rings true to the time of your life you are in, as well – it is what you speak of it. It is not just what you make of it, although that is a big part, but it is what you say about it. When you speak positively about the things you are dealing with, the place you are in, and the lessons you are learning, they become beautiful for what they are. When you speak anger and bitterness about where you find yourself while you watch others seemingly accomplish and receive all that you long for, this season in your lfie becomes one of bitterness and anger. That verse speaks a lot to me about myself and the seasons I find myself in. I have to get rid of those things, and I also need to “forgive” others who are in the season I wish I was walking through. Not that those people did anything wrong, but I have become bitter towards them, jealous towards their lives, and angry about their position vs mine. Mind you, this doesn’t look like rage and slander on the outside – I’m talking about the condition of my heart at times. I have to let it go, to allow them to walk in this season and to celebrate with them when they celebrate and to mourn with them when they mourn. 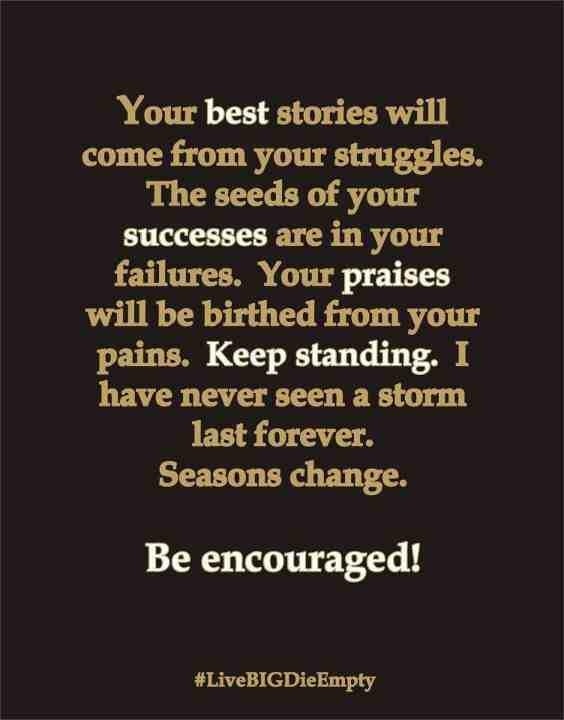 Pastor Steven makes a good point in his first sermon on Times and Seasons – every season has struggles on the inside that you cannot see from the outside. You know this is true. When I am single and longing for a romantic relationship I see everyone else all cuddly, holding hands, kissing cheeks, in la-la-land and find myself annoyed and jealous. I bitterly go through my life wishing I had someone to share this nasty new recipe I just tried or go see the newest movie I’ve been wishing to see. Get rid of all bitterness. BUT, then I find myself in a romantic relationship, constantly battling with my partner to work through the hard parts of life, and at times still having to try nasty recipes alone. I find myself considering another person’s time and needs and not able to fully pursue my own timeline and my own needs. There is often a longing for what once was, even just a hint, a lingering wish for the bliss the previous season had. But in the past season you longed for what was ahead, imaging it to be blissful and fulfilling on it’s own. It is never fulfilling like you once imagined it might be. How about when you were a kid and just thought, “once I can drive, then life will be great!” Or, “once I’m in college life will be perfect.” And then when you get to college you find yourself wishing for the simplicities of childhood where life was so easy. Ok, college is easy too, who am I kidding? Once you get out of college you find yourself wishing for a life of classes, naps, and endless amounts of social time with friends.